Plans to fill a nuclear landmine with chickens to regulate its temperature were seriously considered during the Cold War. Civil servants at the National Archives say it is a coincidence the secret plan is being revealed on 1 April. The Army planned to detonate the seven-tonne device on the German plains in the event of having to retreat. Operation Blue Peacock forms part of an exhibition for the National Archives, in Kew, London, on Friday. Professor Peter Hennessy, curator of the Secret State exhibition, told the Times: "It is not an April Fool. These documents come straight from the archives at Aldermaston. Why and how would we forge them?" 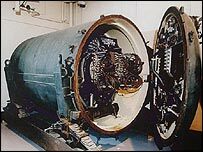 The bomb was designed to stop the Red Army advancing across West Germany during the height of the Cold War. But nuclear physicists at the Aldermaston nuclear research station in Berkshire were worried about how to keep the landmine at the correct temperature when buried underground. In a 1957 document they proposed live chickens would generate enough heat to ensure the bomb worked when buried for a week. The birds would be put inside the casing of the bomb, given seed to keep them alive and stopped from pecking at the wiring. The landmine would be remotely detonated. Tom O'Leary, head of education and interpretation at the National Archives, told the paper: "It does seem like an April Fool but it most certainly is not. The Civil Service does not do jokes."